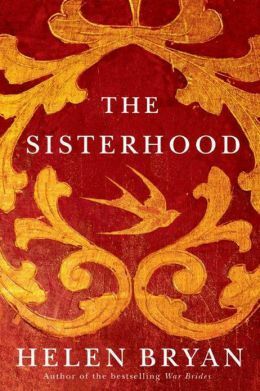 Today I'm featuring the opening and a teaser from a current read, The Sisterhood by Helen Bryan--a Kindle purchase that I am reading for one of my book clubs. It is midnight, but only the orphanage children sleep. At sunset a messenger came from the valley to warn the Abbess. Like wolves slinking toward the sheepfold, the Inquisition tribunal are drawing closer and will soon be upon us. All in the order, from the youngest novice to elderly bedridden Sor Augustina, are awake, praying the queen will intervene, and for courage if she does not. We must remember the example of our beloved Foundress in her hour of trial. The first signs appeared in December. By Navidad the warm seas yielded dying fish to the fishermen's nets. Anxious women crowded into the churches, to light candles and beseech God, the Virgin, and all the saints to stay the hand of El Nino. The peasants clung to their superstition that naming the capricious atmospheric phenomenon after the Christ Child might appease it. But this time El Nino came in the guise of the Devil, El Diablo, to turn the noon sky a strange color. People looked skyward uneasily and crossed themselves, muttering prayers as midday turned black as night, the wind rose, and a hard rain began to fall. The sky sank lower and lower and the wind gained strength, and people called on older, darker gods before abandoning prayers altogether to shout for their children and run for shelter. My thoughts: This work of historical fiction, which spans several continents and centuries, is an engaging page turner. From Spain during the Inquisition to contemporary times in Europe, and North and South America, the characters and storyline have me captivated. I'm sure there's a lively book discussion in my future. First Chapter ~ First Paragraph #85 and Teaser Tuesdays was originally published by Catherine for bookclublibrarian.com. This post cannot be republished without attribution.